1. Delivery time of sample. The sample of each product is normally available with us and will be couriered on the next working day of the request(Day). The delivery time of the sample will be 1-7 days depend upon the customer location. 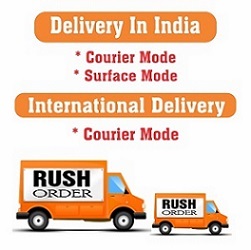 In most of the products we offer free sample but the customer has to pay the courier charges depend upon the product. Once we will receive the filled request form, Our executive will mail you the cost of courier charges and delivery time. In case of samples which are chargeable the customer will be given detail about the cost. The customer has to bear the cost. We can send minimum one sample of each product. If the customer requires more than one sample then the customer has to send the request for more samples. Our sales executive reserves the right to decide the number of samples to be send to the customer keeping in view the cost of product. We reserves the right to deny sample in case of high product sample cost. Normally, We keep stock of each and every variety of product. But if the customer needs the special or customized product sample then we can make it according to the specific requirement. The customer has to pay the sampling charge for the specific product before starting the procedure of sampling. The customer has to fill the contact detail form along with the specific requirement and submit the request. Upon receiving the request, Our sales executive will respond on the next working day of the request(Day).